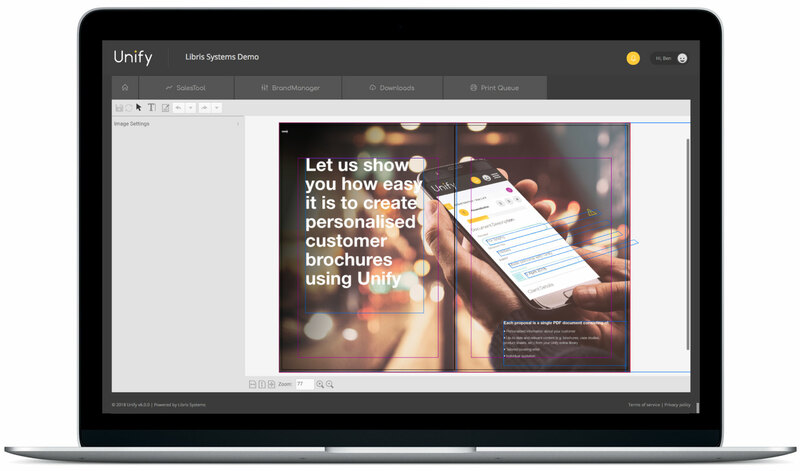 Unify+ is our cloud-based store for all those marketing collateral documents that you use and modify on a regular basis, such as stationery, leaflets, sales documents, data sheets, brochures and contracts, etc. Companies constantly invest time and money in updating their marketing collateral. To do this, they require complex publishing software such as Adobe Creative Suite, and highly trained staff or contract agencies to undertake costly artwork changes. Our easy-to-use interface enables any non-technical users to make artwork changes to existing documents and create new collateral items, without compromising agreed design formats and brand guidelines. By using ‘unbreakable’ smart-templates, marketing teams can quickly create new collateral documents, saving time and money. 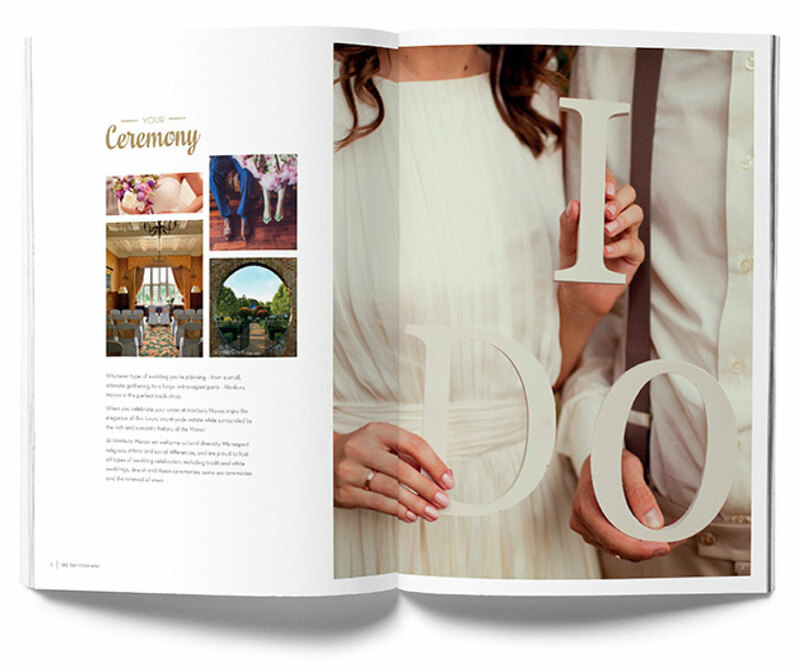 Unify+ has the capability to use Adobe InDesign files, so that you can use your brand’s pre-existing marketing assets. The publishing possibilities are endless due to the flexibility of our system. Every new document is created from a master template that is uploaded and stored in Unify+. These can range from business cards, brochures, data sheets and case studies to contracts or terms and conditions. Once in the system, vital branding elements of a template design can be locked-down, such as logos, fonts and sizes, colours, images and layout, etc. This control guarantees brand consistency within all future documents produced from a master template. The simple-to-use interface gives any non-technical user the ability to create new marketing collateral without the need for complex software or training. From a master template, unlimited new ‘live’ documents can be produced in the same format. For example, a two-page case study would be made up using two templates, (one template for the front and one template for the back). Once a case study master template is duplicated it becomes a ‘live’ document and is saved within the system. 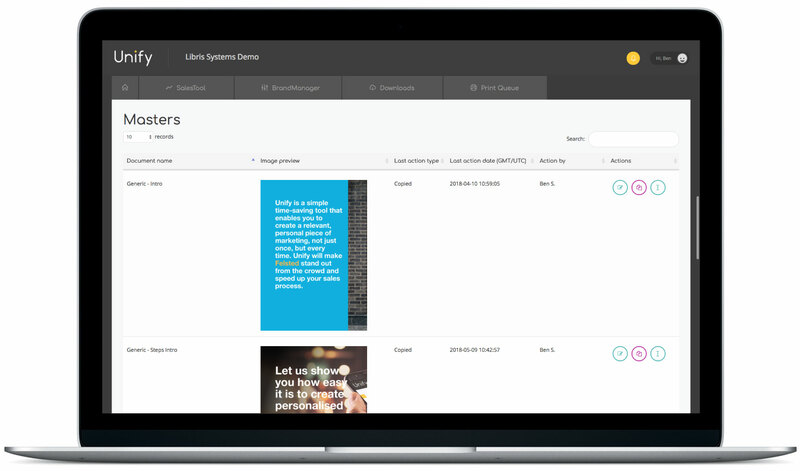 These documents can be shared directly with a Unify Sales Tool to keep your sales team up-to-date with live content. Pre-determined user group permissions govern the extent of changes that a single user can make to these new ‘live documents’. For instance, text amends only, or alternatively, both text and image changes may be permitted. However, crucially in each scenario, the important brand elements cannot be amended or deleted. Multiple user groups can be created and assigned bespoke access permissions to control each master template stored on Unify+. With this level of control we can assign who has permission to create new documents and to what extent changes can be made to the content on each page or pages. 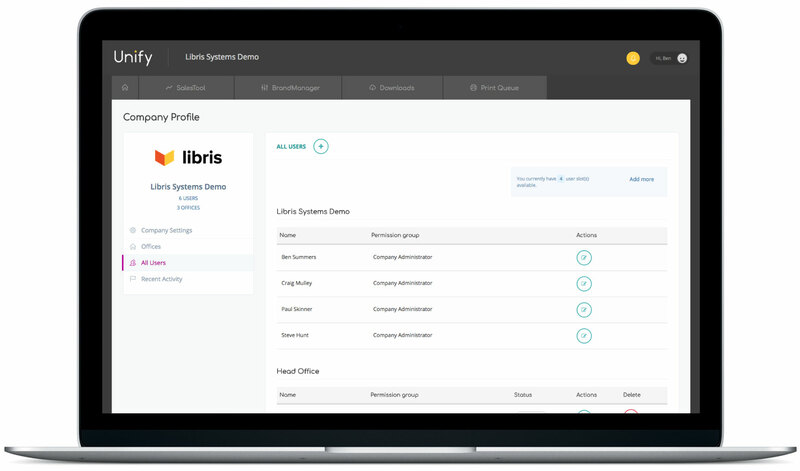 This controlled access gives assurance that non-authorised users cannot change sensitive information. Access control can be locked down even further so that each element on a page (e.g. text and images) can be controlled individually by different user groups. If your organisation has sub-brands, global offices or re-sellers, smart templates allows generic content to be re-flowed in different design or branded layouts. This allows content to be shared with sub-brands, local markets and re-sellers who need up-to-date marketing material ‘wrapped’ in their own branding. 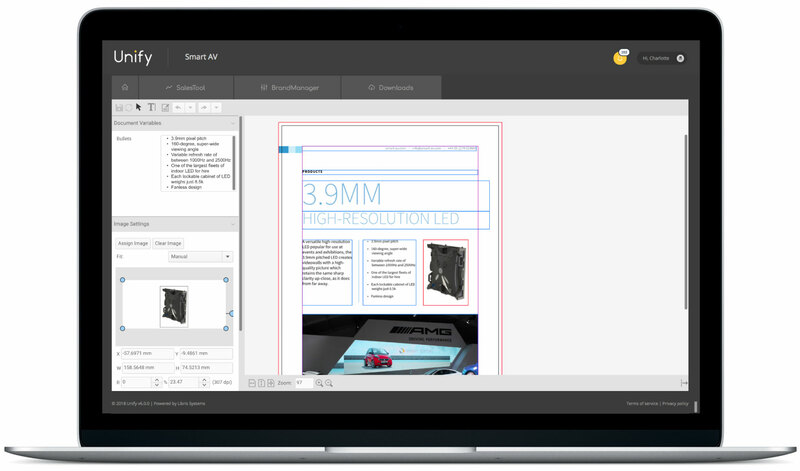 Smart templates also allow documents such as press adverts to be translated and re-sized to new artwork dimensions at the click of a button. Once in Unify+, documents can be published to PDF or direct to print. Users can create low resolution PDF files for internal printing or emailing to clients from any document in the system. High-resolution, print formatted PDF files can also be created, avoiding ‘pre-press’ production headaches. Unify+ can connect directly to our Digital Print Network including delivery, allowing print-on-demand to speed up the order process and change the way you use print forever. 24/7 PDF publishing gives your sub-brands, local markets and re-sellers the ability to create and print marketing material when they need it. Unify+ guarantees your marketing collateral remains ‘on-brand’, everywhere. Established companies often underestimate the vital importance consistent brand marketing has on business success. People prefer to do business with companies and brands they are familiar with. When your brand marketing is consistent, it provides confidence in your products or services. Customers are put at ease and they know exactly what to expect each and every time they experience your brand. So often marketing departments and sales teams fail to work closely with one another to ensure all brand marketing material is consistent. Marketing departments’ resources are often stretched to deliver the volume of collateral required, hence sales teams often ‘go-it-alone’ and produce their own presentations and literature that can be sub-standard. Unify+ bridges the gap between marketing and sales divisions, streamlining the process and empowering both to produce effective ‘on-brand’ collateral, faster and more efficiently than ever before. Find out how Unify+ has increased independent capabilities of the sales team, which has in turn improved the daily outreach sales process at Smart AV. Read about how Elavon has managed to create a total time saving of 1,500 hours per week using our software.